he Irish scientist John Tyndall, one of the most distinguished physicists in modern history, provided evidence in 1861 that human-generated gases such as carbon dioxide and ethylene transmit enormous volumes of heat. Tyndall wrote of “the astonishment with which I saw the foregoing effects” of gases capable of trapping heat then released into the earth’s atmosphere, remaining there. While Tyndall was unearthing these discoveries in the early 1860s, the Industrial Age had already taken off 100 years before. The Industrial Revolution, which began in Britain around 1760, was one of the defining moments in human history: the gradual shift away from “old-fashioned” manual devices towards machines and fossil fuel powered engines. It heralded the era of mass burning of coal, later gas and oil, which continues apace to current times. Since the start of the Industrial Revolution almost 260 years ago, global carbon emissions have increased by over 260%. Indeed, it was recently discovered that the planet has in fact been warming for about 180 years, dating to the 1830s, due to human exploitation of fossil fuels. A decade before this, in the 1820s, an eminent French physicist Joseph Fourier – a scientific adviser and companion of Napoleon – had already deduced that something unforeseen was occurring within the globe’s atmosphere. Fourier, noting the earth’s distance from the sun, calculated that our world should have been much colder than it was in reality. He concluded that the planet’s atmosphere had the ability to trap great volumes of heat, in a similar manner to a human-designed greenhouse. Fourier was christened as the discoverer of the “greenhouse effect”, a term coined later for the atmosphere’s absorption of largely human-engineered carbon emissions. The warning signs regarding the climate were being written from a very early stage. Even before Fourier was outlining his groundbreaking analysis, famous Industrial Revolution inventions had for years been spewing out carbon emissions – such as the steamboat (created 1787) and steam locomotive (created 1804), run through heavy consumption of coal. 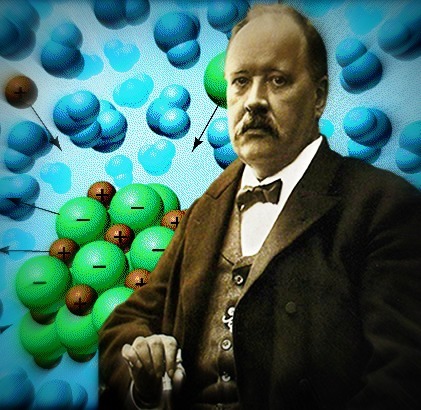 Come the end of the 19th century Sweden’s renowned physicist, Svante Arrhenius (image on the right), was the first person to estimate the impact of carbon dioxide upon the planet. In early 1896 Arrhenius noted that the burning of fossil fuels, like coal, contribute significantly to world carbon emission levels, therefore leading to a heating globe. With regard rising greenhouse gases, Arrhenius wrote that the results would be felt “nearly the same over the whole earth”, but that “the effect will be less there [in the Southern hemisphere] than in the Northern Hemisphere”. He accurately estimated that, “if the quantity in carbonic acid [carbon dioxide] increases… the temperature will increase nearly in arithmetic progression”. Arrhenius further compiled the world’s total coal production levels in the late 19th century, which he wrote were a seemingly massive “500 millions of tons per annum” (global coal production has recently been around 7,000 million tons each year). Arrhenius’ work was publicly available from 1896 onwards: That year his paper was published first in German, then quickly reprinted in English with the long-established London, Edinburgh, and Dublin Philosophical Magazine and Journal of Science. It may have been clear to anyone who read Arrhenius’ findings that the world would continue heating, yet full-steam-ahead policies were continued by business industries. Some of the technological advancements were heavily reliant upon extraction and burning of fossil fuels. A decade before, in 1885, the German engineer Karl Benz (image on the left) had developed the petrol (gasoline) powered automobile, one of the most significant creations in the human world. Yet, if truth be told, also among the most harmful. The reality is that cars, along with other vehicles like trucks, are today the largest contributors to carbon emissions in America. The US is the world’s second largest greenhouse gas emitter, but in overall history the country is by far the largest carbon producer, with the highest per capita emission rates today among the major powers. Along with other policies, Donald Trump‘s business-led administration is currently dismantling emission regulations on vehicles, as efforts to curb such gases are impacting profits. One can again only marvel at the corporate desire to burn up the planet as quickly as possible. There are over 260 million vehicles in America and more than a billion around the world, releasing gigantic quantities of carbon dioxide into the environment each year. The transformation to electric vehicles has been painfully limited (three million in use globally). Electric cars are far less lucrative to fossil fuel reliant corporations like Volkswagen and Nissan – who have gone so far as to falsify emission levels in their recent models, such is their dedication to profits. As the 19th century moved into the 20th, emerging were further evidence-supported works regarding a heating planet. In 1938 the English inventor and engineer, Guy Stewart Callendar, believed that almost all the carbon dioxide produced by fossil fuel consumption remained within the earth’s atmosphere. Callendar provided evidence that greenhouse emissions were behind the gradual rise in temperatures of recent decades, and would continue into the future. “human beings are now carrying out a large scale geophysical experiment of a kind that could not have happened in the past, nor be reproduced in the future. Within a few centuries, we are returning to the atmosphere and oceans the concentrated organic carbon stored in sedimentary rocks over hundreds of millions of years”. “Rapid changes in the amount of carbon dioxide produced by volcanoes… or as, in our case, in the rate of combustion of fossil fuels, may therefore cause considerable departures from average conditions”. “In contemplating the probably large increase of CO2 production by fossil fuel combustion in coming decades, we conclude that a total increase of 20% to 40% in atmospheric CO2 can be anticipated”. The implications of which are being increasingly felt around the world today. As we may see, the consequences of a changing climate were becoming more pointed by at least 1957. Yet, once again, such scientific findings – with increasingly blunt language being used – were overlooked or ignored by elite figures and mainstream commentators. Governments followed suit. The public, as a result, remained unaware of the looming planetary crisis, with business-as-usual policies continuing unhindered. In 1961 another American scientist, Charles Keeling, produced evidence-based data demonstrating that global emissions were undoubtedly rising, due to fossil fuel consumption. His graph, the “Keeling Curve”, has revealed rapidly increasing emissions in the elapsing five decades, a far steeper climb than the 130-year warming period prior to his study. Keeling’s work even prompted America’s National Science Foundation to issue public warnings about global warming in 1963, which were presented to America’s new leader Lyndon B. Johnson late that year. 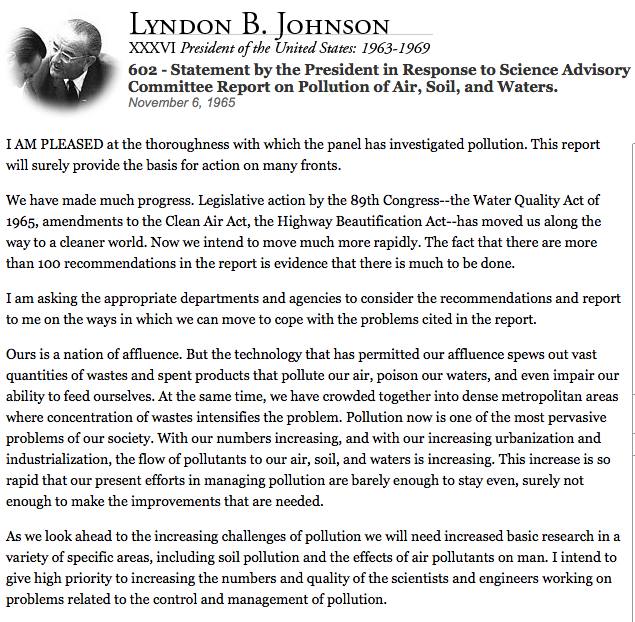 In November 1965, president Johnson admitted that “our affluence spews out vast quantities of wastes… Pollution now is one of the most pervasive problems of our society”. It was a commendable statement that would be anathema to Trump for instance, but words without weight behind them. Indeed, Johnson failed to mention that the planet itself was warming. Had Johnson seriously acted upon the scientific analyses forwarded to him, much of the threat enveloping the earth today could have been reduced. It instead appears that other things were more important, such as escalating America’s war on the other side of the world against Vietnam. Indeed, successive US presidents to the present day have either been unwilling, or uninterested, in seriously tackling climate change. Were America to have taken an early stand against this issue much of the world may have followed suit. In the early 1970s John Sawyer, an English meteorologist, even predicted with accuracy the planet’s rate of heating by the year 2000. Sawyer’s work was published in a long-running scientific publication called Nature, yet as with the above works, it failed to penetrate the mainstream conscience, quickly entering obscurity. In 2008, about 180 years after Fourier discovered the greenhouse effect, slightly more than half of Americans and Britons still did not believe that climate change was occurring due to human activity. It was a particularly telling poll result, considering America and Britain supposedly possess two of the most advanced educational systems in the world. To the present day, large swathes of elite power shun alerting public attention towards climate change. This planet-threatening issue continues receiving scant coverage in the mainstream media, and government leaders avoid discussing it publicly, particularly those governing the rich states responsible for emitting the highest emissions. Addressing climate change goes against many of the requirements of capitalist societies. In America, Britain and across the world, big business interests dictate much of government and media policy, while controlling increasing numbers of universities. This disregard for the environment is captured perfectly by the Republican Party in the US. It is hardly a traditional party, but a corporate-controlled organization intent on greatly enriching its core base. Last November, it was reported that less than a third of Republican Party voters believe humans are causing climate change. About 75% of Republican voters are comprised of white Christians, among them significant numbers of evangelicals. During the 2016 Republican Party presidential primaries almost all the candidates were climate change deniers. This included the eventual victor Trump who, since assuming the presidency, has pursued savage environmental policies that will inflict further harm on the earth. Trump’s climate actions have received remarkably little criticism from power centers, though much condemnation arrives his way for being an alleged “Russian stooge”, amid other unsubstantiated claims.